In our large household the collective investment in iTunes content might rival the GDP of a few small island nations (slight exaggeration). From music to movies and from photos to college papers, our hard drives are filled with items that can not be easily replaced if they could be replaced at all. Today's Macs are not only the storage centers for our desktop or laptop data, they also store the backup data for our iPhones, iPads and iPods. Without a reliable backup system a lost hard drive can be the source of months of frustration, weeks of lost work and vanished memories of special occasions and everyday moments that become special when viewed through the passage of time. To reduce the risk of lost data disasters in our household we deploy a regular Time Machine backup regimen. Last week one of our laptop hard drives gave out. After a year of near 24/7 use by a college student in the household who makes generous use of Netflix streams in between bouts of school work, the drive became unresponsive. A quick trip to an Apple retail store (AppleCare is another Mac essential) the MacBook Pro had a new drive installed and all that was needed to restore the old drive's data was an easy Time Machine step following the new drive's startup and the welcome message from Apple. My preferred Time Machine regimen is to backup data on the hour using an Apple Time Capsule that also serves as the household's Wi-Fi base station. In the case of the hard drive that failed last week the data had been backed up using Time Machine to a local external hard drive. The Time Machine data restore operation took under an hour to complete and all data was restored as if the user hadn't missed a beat. While flash drives and optical media can be deployed to backup work or school files, the automatic backup regimen and the thorough backup routine of Time Machine makes it a better and more comprehensive backup solution. As the author of the Posts At Eventide blog my financial analysis worksheets are stored all over my drive along with several years of financial reports and regulatory filings from the nation's top technology companies. Absent a regular backup regimen replacing the information on my drive would require months of personal work and needless hours spent searching the Internet to replace volumes of lost data. 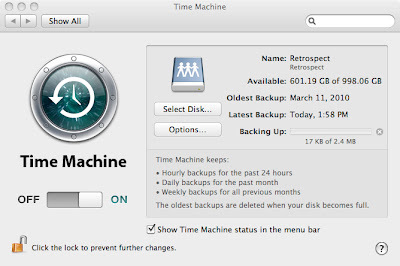 Time Machine is free and is installed with the latest versions of Mac OS X. Time Machine provides for the peace of mind that comes from knowing your Mac's backup data is a virtually up-to-the-minute copy of what's on your drive and all music, movies, photos and personal files are backed up safely in the event of a lost hard drive, a corrupted drive or a more complex repair issue involving your Mac. Large capacity external backup drives can be purchased for around $100. A Time Capsule can be purchased for $299. Either of these backup options are worth the price when some of what's at risk might be considered priceless.